After finding new things and I want to update my answer. When faced with a problem which I got an answer here. But unfortunately if you have lots of answers/questions it is hard, almost impossible to find the answer/question you are looking for. I have been thinking that it would be great to have that feature to facilitate navigation in old posts. Edit - in response to OP's comment. 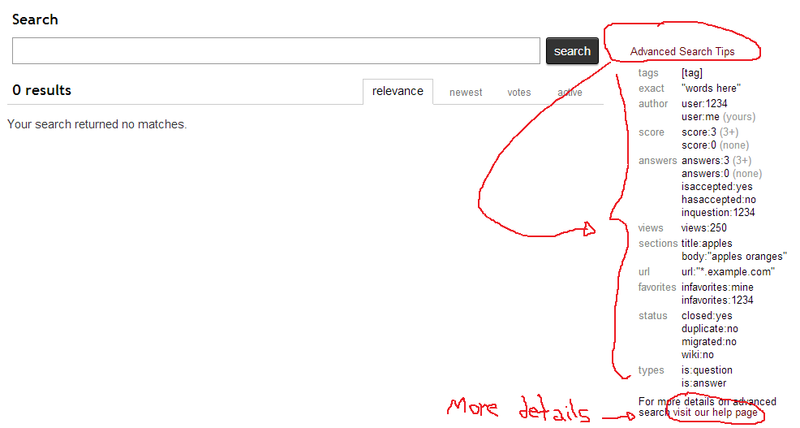 One can easily access the "Advanced Search Tips", beside the question search box. See screenshot below. Not the answer you're looking for? Browse other questions tagged discussion support search favorites . Search through favorite questions, is it possible? Are there usage statistics for favourites?